Note that Jesus knew three things that allowed him to perform this lowest possible task. 3. He knew where He was going: returning to His Father in Heaven. The next word is “so,” followed by washing the disciples’ feet. He could let go of cultural norms and shame because He knew who he was, where he had come from and where he was going, That is, because He had the whole picture, he could rise above any shame and perform this lowest of tasks. What about us? Do we know who we are, where we have come from and where we are going? If we grasp these three facts on an intellectual, emotional and volitional level, we can readily do the lowest task without hesitation, following in Jesus footsteps. So, who are we? Sons and Daughters of the most High King–redeemed rebels who have become royalty, the accused who have become ambassadors, condemned criminals who have become co-workers with God in His great plan to redeem and recreate the universe! Where did we come from? Out of the kingdom of darkness into the Kingdom of Light. Where are we going? Into Heaven, into the presence of God for eternity, into the arms of Jesus as His Bride. These truths will help us to live as Jesus did, letting go of what is temporary and small in the light of this big picture, holding on to what is eternal and great, then rising above whatever comes into our lives. Let’s think about how Jesus let go of what He had, while he held on to who he was, so he could rise above whatever came. He let go of the glory he had from before the beginning of time and became restricted to a human body, totally submitted to his parents, He held on to His love for the Father, and rose above his abhorrence of sin as he had to live with it for 33 years. He let go of his comfort and pleasure in heaven, coming to live on the earth with fleas, lice, stench and dirt, with evil, suffering, injustice and death. He held on to who He was, the Son of Man, the Son of God, and was able to rise above the terribleness of life on a fallen planet. He let go of His full part in the Trinity by limiting himself to a human body. He held onto his relationship with the Father and the Spirit, praying constantly, following the Father’s direction in detail, and rose above the unbelief of those around him, above the unfaithfulness of his followers. He let go of the privileges and position he had in Heaven where the angels constantly worshiped Him. He held on to the knowledge of what He was going to accomplish on the earth–the salvation of all who will believe–and he rose above the attacks of men, the shame of doing the menial, and the fear of what people think. He let go of his own will. In the garden he prayed, “If it be possible, let this cup pass from me, but your will be done, not mine.” He held on to the Father’s wisdom and faithfulness, and was able to rise above the terrible physical suffering of beating, whipping and crucifixion; of the emotional pain of being rejected, abandoned by his followers, of the spiritual agony of being abandoned by his Father. He let go of the appearance of failure in his death, He held on to Truth of what was going to happen and was able to rise above defeat, death and the devil to bring light and life to the whole world. 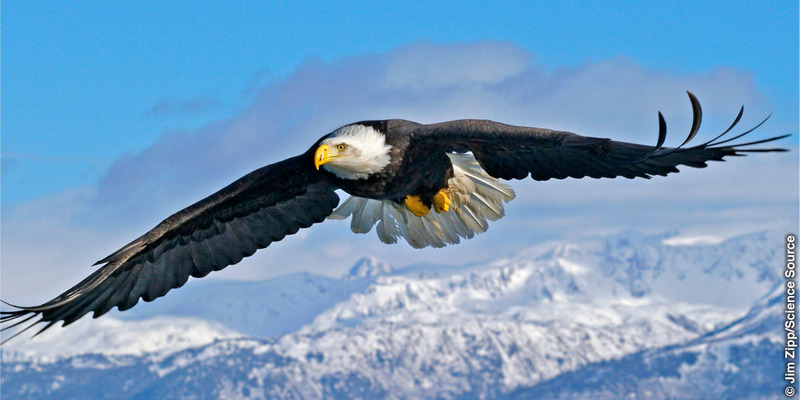 We, too, like Jesus, can let go of the values of this world, the ideas of the creatures and culture around us, hold on to the Truth of God’s Word, His love for us, His plan, and rise above whatever difficulties, attacks and pain comes into our lives, like the eagle in this picture (off the internet). Knowing who we are, where we have come from, and where we are going can empower us, as it did Jesus, to deny self, take up our cross and follow Him in serving others.